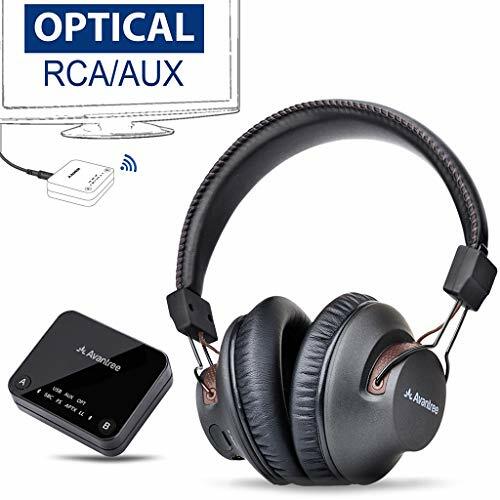 【PLUG & PLAY Wireless TV Headphone Transmitter SET】Just turn on the Bluetooth transmitter (Audikast) and the Bluetooth headphone (AS9S) - they will connect automatically, without needing to pair. 【FLEXIBLE USE】Headphones (AS9S) can be used seperately with other Bluetooth transmitting devices, e.g. cellphone, PC, TV. Transmitter (Audikast) can be used seperately with any Bluetooth receiving devices, e.g. headphones, speakers. 【UP to 100 FEET RANGE】The Audikast's Bluetooth Class I technology transmits audio signals up to 100ft. NOTE: Operation range is affected by physical obstructions (walls, people), wireless interference (Wi-Fi routers, Wireless TV adapters) and also depends on receiving device (e.g. TWS earbuds and devices with small internal antennae may have shorter range).